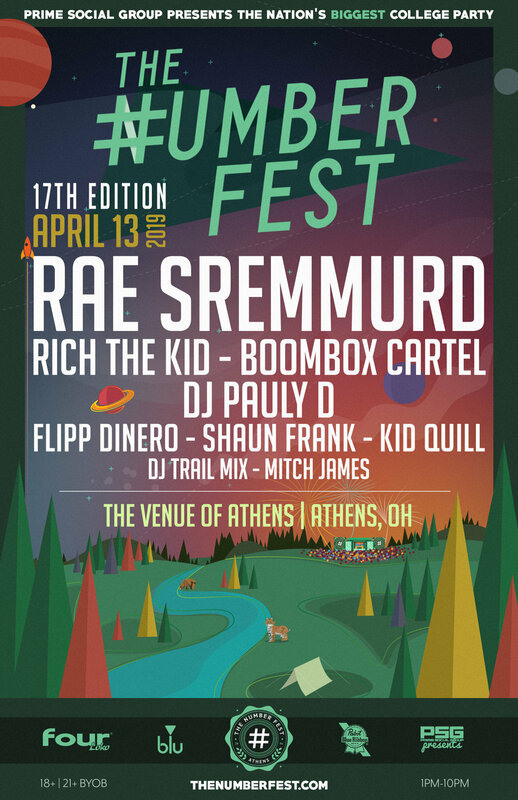 Prime Social Group announces its lineup for the nation’s biggest college party, #Fest (pronounced Number Fest), which will take place on April 13, 2019, in one of the biggest college towns in America, Athens, Ohio. Prime Social Group is based in Columbus, OH. The “#Fest” brand is one of over 16 festivals produced annually by the fast-growing full-scale production and promotions company. Headed by Adam Lynn and Zach Ruben, the PSG team has produced more than 800 events around the world from Ohio, to Barcelona, to Puerto Vallarta. Athens is home to Ohio University, ranked as the #1 party school in America. Athens will be hosting its 17th edition of the festival and will be offering camping the day prior to the event as an added feature. This year’s lineup hosts an array of talent including hip-hop sibling duo Rae Sremmurd. The duo has become considered an international powerhouse and has been dominating the charts since 2014 with their booming party anthems, including their viral track Black Beatles featuring Gucci Mane. On the lineup is Atlanta’s trap megastar Rich the Kid. He came out swinging right from the start of his career with his heavy hitting tunes, but his real defining moment came with the release of Plug Walk, which has racked up 305 million streams on Spotify. The lineup also includes genre-blending producer Boombox Cartel, reality star - DJ Pauly D, more artists including Shaun Frank, Flipp Dinero, and Kid Quill. Prime Social Group always ensures top tier entertainment with each edition. #Fest has established itself as the nation’s premiere college party and built a reputation for curating the future sounds of tomorrow’s superstars. Past #Fest lineups have included Kendrick Lamar, Diplo, Marshmello, Migos, G-Eazy, The Chainsmokers, Young Thug, Lil Uzi Vert, Louis the Child, 21 Savage, much more. The #Fest is an 18+ event and is expected to reach about 15,000 attendees. Tickets are on sale and available to purchase. The completely sold out 80-hour event of non-stop music takes place this weekend with a powerhouse lineup.